At the start of March, it was my husband's birthday. And my husband is notoriously difficult to buy for. His main interests include football (but not one specific team), business/stock trading, Ugandan music, and personal grooming. There's not much that fit those categories on the high street aside from the exhausted options of beard trimmers, shower gels, and moisturisers. I was desperate to give him something different. Something a bit unusual - and memorable. I ended up buying him a range of things that I found in Tesco. I bought him honeycomb, whole nut chocolate, a portable phone charger, and a new moisturiser. 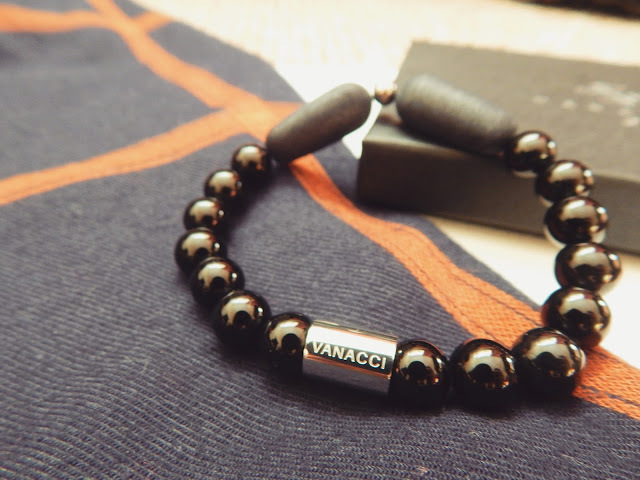 But then Vanacci got in touch offering to send me one of their products to review and I was excited - maybe this was the long-awaited gift that my husband would cherish. I looked on the website and it was full of necklaces and bracelets for men and women that really looked expensive and well made - but were actually reasonably priced. They had solar themed bracelets but what really caught my attention was the lockstone collection. Basically, some of their bracelets, necklaces, and cufflinks come with lockstone (aka terraforce)attached to it. So, you spray the stone with perfume, let the stone absorb it for 4 minutes, then it slowly diffuses the scent throughout the day. I can confirm that my husband absolutely loved the gift. It came in a box and looked really sophisticated. I loved the shiny black pearls and the engravement of the company name on a silver bead. Also it holds the scent really nicely. This is definitely a lovely present for the man in your life. In all honesty, I like this product so much that I may have to steal it back from my husband. Have you tried any products by Vanacci? That sounds like such a cool idea. Might look into getting one for my dad.